DJI has lifted the covers from its latest drone offering, the DJI Mavic Air, a highly-portable drone which is capable of recording high-quality 4K videos as well as Full HD slo-mo videos at 120fps. We had already found out most of the specs thanks to the full leak the day before the unveiling. The Mavic Air boasts of a sleek design and can be folded into the size of a regular smartphone, making it an ideal choice for backpackers. DJI claims that the Mavic Air is the smallest drone in its lineup to feature a 3-axis mechanical gimbal which can significantly dampen vibrations, allowing the camera to click better pictures. In the camera department, the Mavic Air features a 12MP 1/2.3” CMOS sensor which is capable of shooting spherical panoramic pictures by stitching 25 different photos to create 32MP stills, aside from taking highly detailed HDR shots and 180-degree panoramas. The Mavic Air can also record 4K videos at up to 30FPS (100MB/sec) as well as slo-mo Full HD and HD videos in a range of 24-120FPS. The device also comes with 8GB of onboard storage which can be expanded by using a MicroSD card, while file transfer is handled by a super fast USB 3.0 Type-C port. The Mavic Air, despite its small profile, comes with a wide array of software goodies such as ActiveTrack for following a moving subject, Smart Autonomy 2.0 with Advanced Pilot Assistance System (APAS), and SmartCapture to name a few. The latest addition to DJI’s Mavic line-up of drones comes with its own foldable controller which can accommodate a smartphone and pairs the drone with it using a companion app. The Mavic Air offers a maximum flight time of 21 minutes and can cruise at a top speed of 68.4 km/h. 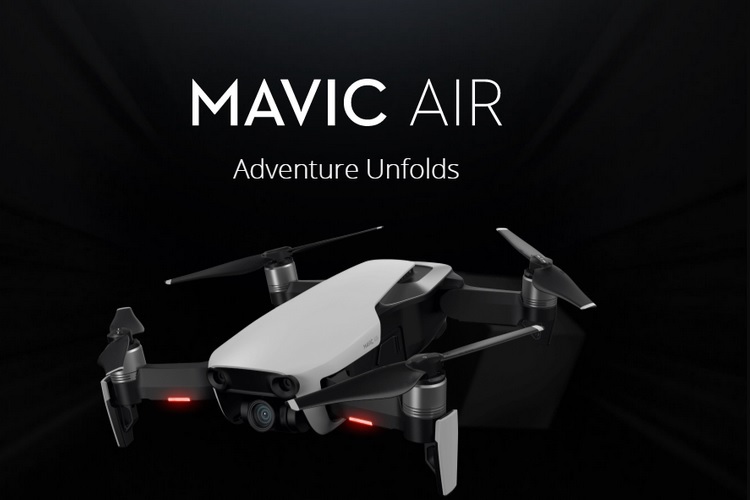 The Mavic Air comes in Onyx Black, Arctic White, and Flame Red color options and has been priced at $799 for its basic bundle, while a more accessory-heavy bundle called Fly More Combo will be available for $999. DJI’s latest creation is already up for pre-order on its official online store and it is expected to ship starting January 28, the same time frame around which it will hit the shelves of brick-and-mortar DJI stores and authorized retail partners.